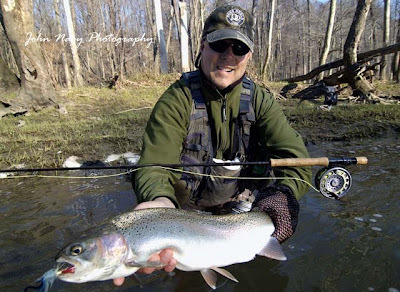 Rich Schmidbauer with spring hen steelhead caught on a traditional swing presentation with a Blue and White Temple Dog tube fly. 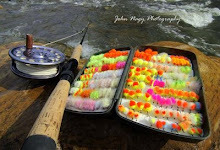 John Nagy Photo/ Guide Trip. 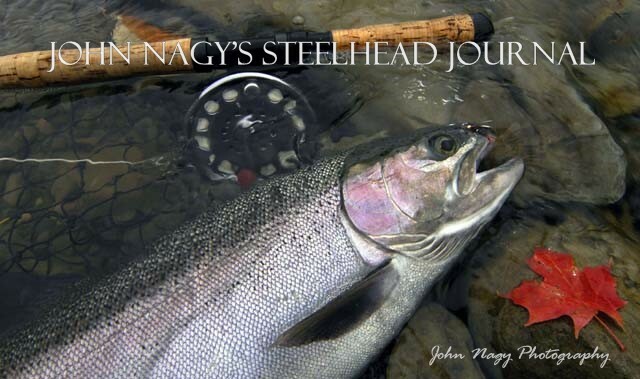 Reward: Hard Hitting Steelhead Hell-bent on taking your Fly (and Fly rod) back to Lake Erie! Also learn about "Temple Dog" style Scandinavian tube patterns (tied with Yuri Shumakov, Mikael Frodin and Eumer tube body systems) which are some of the hottest steelhead flies going on the Great Lakes right now. Experienced traditional fly fisherman who have experience at swinging flies in the Atlantic provinces for salmon and British Columbia for steelhead (but haven't tried it on the Lake Erie tributaries) are also welcome. Swinging flies is a whole new approach for the Great Lakes steelheader who has "cut his teeth" on dead-drift presentations and is looking to expand his horizon's and experience a different steelhead presentation. This traditional technique is best done on bigger water that has long pools and wide tail-outs to active steelhead in water temperatures above 40-45 degrees F.
Typically this means the fall, late winter/early spring time or during mild winter periods. It allows him to see the river in a larger view both downstream and bank-to-bank as he fishes. He becomes more in tuned with the larger flow of the river. The casts and mends of his fly line become intimately intertwined with long runs, riffles and pool tail-outs as he methodically swings his fly through likely steelhead lies. 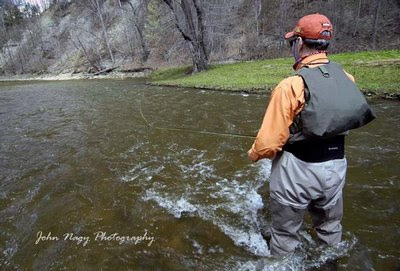 Steve Anderson swinging flies on a big Lake Erie tributary. Note "belly" formed in the fly line on the downstream swing presentation. 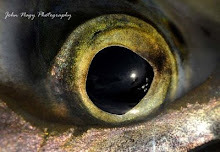 John Nagy Photo/Guide trip. This slower, more patient approach often rudely becomes interrupted with the jarring/slamming take of an aggressive steelhead (a "player") which is hell-bent on taking your fly (and fly rod) back to Lake Erie! "But the steelhead, with the brightness of the sea still on him, is livest of all the river's life. When you have made your cast for him, you are no longer a careless observer. As you mend the cast and work your fly well down to him through the cold water, your whole mind is with it, picturing its drift, guiding its swing, holding it where you will know he will be. And when the shock of his take jars through to your forearms and you lift the rod to its bend, you know that in a moment the strength of his leaping body will shatter the water to brillance, however dark the day."